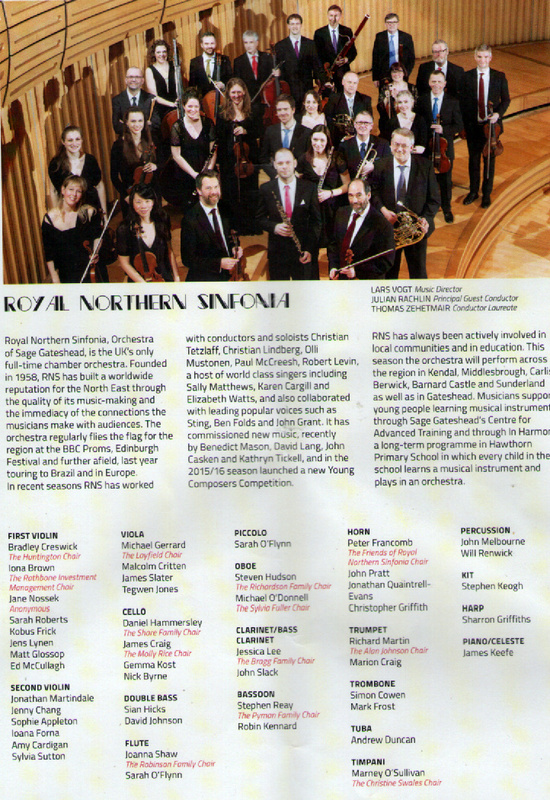 Royal Norther Sinfonia conducted by Roderick Dunk w. Anna O'Byrne; Caroline Sheen; Damian Humbley: Jon Boydon. This was absolutely superb - not a jazz gig, not even slightly, but as a showcase for, perhaps the greatest songwriter the world has ever known, it couldn't be bettered. Guest conductor, Dunk, pointed out that he loved hearing Frank or Ella singing Porter and the wonderful arrangements of Nelson Riddle, Billy May etc. but, this afternoon was about hearing the songs as they were originally performed on Broadway. The songs, we know, are great. They provide a launching pad for all jazz musicians, and singers past and present. However, this afternoon it was the words, the lyrics, that totally captured me. Songs that I've listened to for years suddenly had new lyrics whilst the humour, the double entendre, of some of the others made me wonder how I'd missed them the first (and subsequent) times around! As Jon Boydon sang Brush Up Your Shakespeare, the incredibly clever and funny number from Kiss Me Kate I wondered if in, say 500 years time, someone will write a tune called Brush Up Your Cole Porter? They should and next week would be better than half a millennium away. This was all about Broadway and, as everyone knows, The Great White Way's motto is 'The Show Must Go On'. Today proved it. David Thaxton had to pull out due to family illness and Damian Humbley stepped in. Damian had drove/flew/trained/biked/walked [delete as appropriate] 300 miles, for a 10;30am rehearsal the previous day and gave a performance that suggested it was just another day at the office! Fantastic! Amazingly, Boydon, who'd been on the gig a little longer did fluff a couple of lines but I doubt if anyone else noticed. It didn't lose him any points and, of the two guys, he was the jazzier. The girls were gorgeous and they had voices to match. Anna O'Byrne, Australian opera singer, sang with the range expected of someone whose career has encompassed leads in such diverse vehicles as the Magic Flute and Sweeney Todd. Caroline Sheen, the sassier of the two - think Garland/Merman - completed the quartet. Her Why Can't You Behave?most certainly would have had me behaving. This was one non-stop concert and, much as I love the John Wilson shows, this was every bit as good! 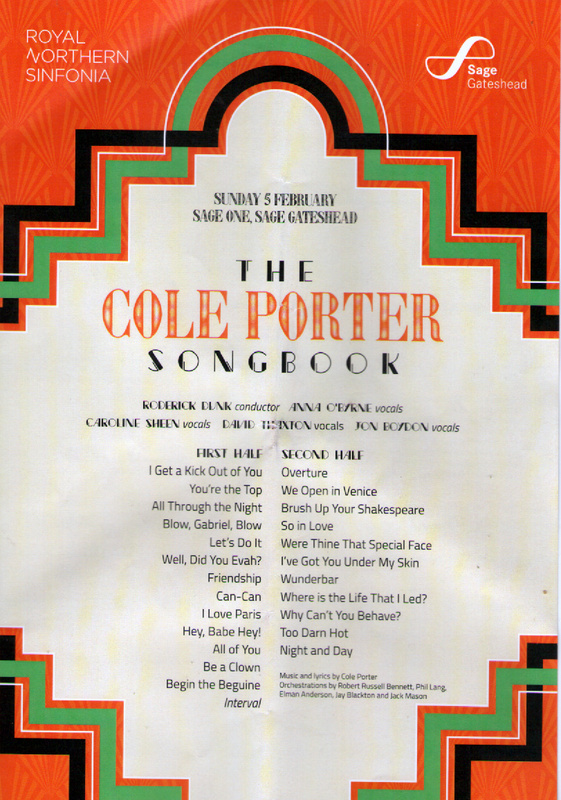 Thank you, Sage, thank you, Cole Porter. Earlier, on the concourse, James Birkett led his aspirants through a short set that heartened me for the future.